With the disappearance of birds, mammals and other species from forests, the “empty forest” syndrome is becoming an increasing reality in Indonesia. Read more below to find out the effects people are starting to see and what can be done to prevent this tragedy. Read more about issues affecting wildife in Borneo, then join the discussion on Facebook and Twitter. 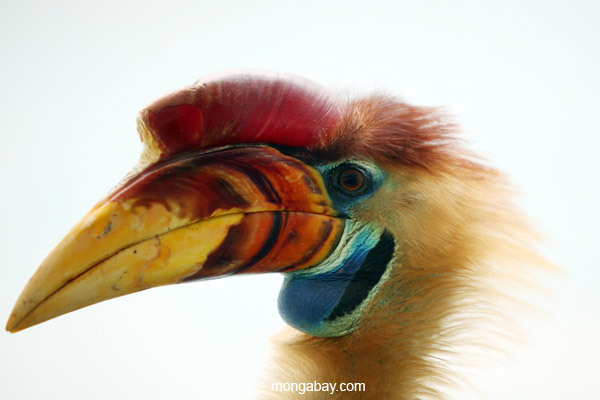 Hornbills are killed in Indonesia for the traditional Chinese medicine market. Tropical rainforests are the most species-rich ecosystems in the world. Each square kilometer has hundreds of tree species, birds and mammals, and countless other creatures. The idea that these forests could be devoid of animal life therefore seems ludicrous. Still the disappearance of birds, mammals and other species is what is happening in Indonesian forests. The “empty forest” syndrome is becoming an increasing reality in this country. The concept of the “empty forest” was first mentioned in 1992 in a scientific article and referred to forests that had lost all their large mammals. The forest itself could ecologically be pristine, with big trees and good canopy structure, but hunting and wildlife collecting had removed nearly every single larger animal. A good example of an empty forest near home is the CIFOR forest in Bogor. This smallish area of actual forest with sizeable trees is located near the Center for International Forestry Research. It is entirely surrounded by villages. The site is often chosen for sinetron filming. If you have ever watched mystical Javanese warriors fly through the air on television, they were likely doing so in the CIFOR forest. But apart from flying kung-fu fighters, nothing much else stirs in this forest. No birds are singing, no gecko calls, nothing much moves on the ground, and the last squirrels I saw there is quite a few years ago. It is strangely silent. I can only guess what happened to this forest’s wildlife, but, most likely, people collected virtually every single mammal and bird. 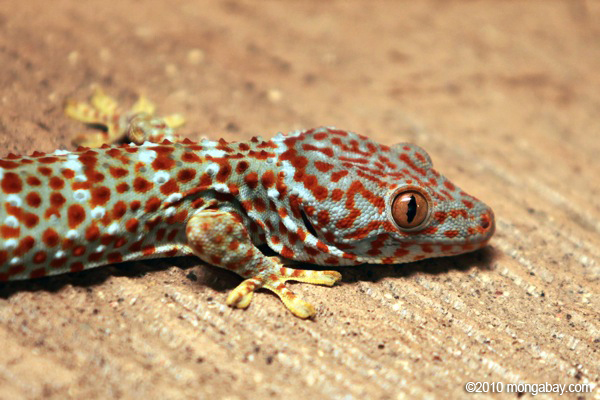 Tokay geckos are widely collected for the pet and medicine trades. An interesting contrast is the housing complex where I live in South Jakarta. It is entirely surrounded by Jakarta suburbia, but the estate’s management has retained a fair number of big trees, and houses have gardens with bushes and scrub. Even though in terms of forest structure this estate is nowhere near as natural as the CIFOR forest, my species list so far has 40 birds, seven mammals — including regular sightings of otters — and nine reptile and frog species. Especially in the mornings there is a cacophony of bird calls mingling with the hum of the nearby traffic jams. The main difference between the two areas, as far as I can see, is the persistent collecting pressure by local communities in one area, and the near-complete absence of it in the other. Such hunting and collecting is, however, not restricted to densely populated areas such as West Java. Camera trapping programs deep in the forested interior of Kalimantan, at least 100 kilometers from the nearest town, show that people travel to areas as remote as this to collect valuable species. They are primarily looking for expensive forest products such as gaharu or aloeswood, but will collect any other useful wildlife they can find, such as anteaters, hornbills valued for the use of their beaks in medicine, or song birds. A kilo of good gaharu is worth 400 million rupiah ($35,000), an anteater (or “pangolin”) will earn a hunter one or two million rupiah more, and a straw-headed bulbul, a very popular cage bird now virtually extinct in the wild, can be sold for a few million rupiah too. Obviously these collecting and hunting trips are very much worth it. All through Indonesia people are going ever deeper into forests collecting whatever has monetary or nutritional value. There is an enormous demand in Southeast Asia for wildlife, either dead or alive. Geckos, hornbills, pangolins, pythons, cockatoos, and a huge variety of song birds are among the many species traded in vast quantities within the region. The latest craze is flying squirrels, cute, furry little animals that are sold in the thousands to be kept as pets. With the largest forests in the region remaining in Indonesia, and wildlife populations on the Asian mainland already very much depleted, Indonesia is becoming the main supplier of wildlife in the region. To prevent the empty forest syndrome in Indonesia something needs to be done urgently. Good protected area management is a start, but effectively guarding all areas of remote forests and seas is virtually impossible. The least the government should consider is to publicly acknowledge what natural treasure Indonesia stands to lose if it doesn’t find more sustainable ways to manage species harvests. Updating and publicizing the list of protected species, which largely dates back to Dutch colonial times, would help, as well as expanding the illegality of activities that are harmful to threatened species. The Indonesian conservation authorities are working on this, which is laudable. I saw a draft law in 2012, which was supposed to update the basic conservation law No. 5 of 1990. It looked impressive and had among many other instructions, a whole range of punishments for snaring, trapping of wildlife. There was a fair bit of public debate about the law with people complaining that the fines were outrageously high. For example, Article 87 in the draft law had a 10 billion rupiah fine for setting a snare trap, while Article 86 suggested a fine of 7 billion rupiah for catching, killing or trading in protected species. In the old law of 1990, prices varied from 50 to 200 million rupiah. Whatever the size of these fines, they appear largely irrelevant because they are rarely if ever enforced. 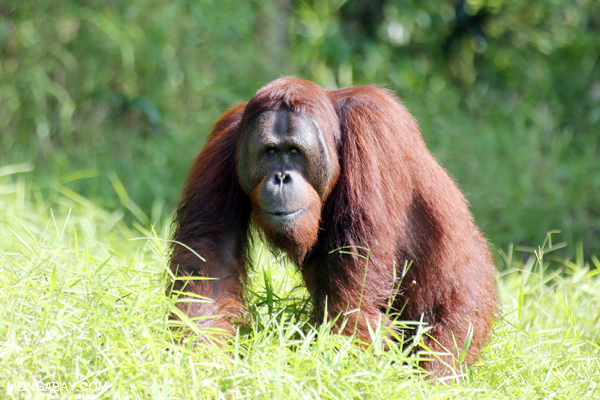 Orangutans are often captured for the pet trade after their habitat is destroyed for oil palm plantations. In some regions the ape is eaten as bushmeat. Which judge will fine a local hunter 10 billion rupiah for setting a snare in the forest? It just ain’t gonna happen. It would be much better to have realistic fines that would actually be enforced. Anyway, as far as I am aware that law hasn’t yet been approved and signed. The authorities need to do some hard thinking about how to not just maintain Indonesia’s forests and their many services to society, but also to ensure that these forests are ecologically functioning and have wildlife in them. After all, a forest without wildlife is like a car without an engine — most basic components are there, and it may be nice to look at, but it is not going to function properly.